Failed smog today due to "DATA FAIL OBDII"
Looks like it. Open O2 dump has to go and put your stock exhaust back. You will also need a tuner to fix your tune to pass smog. damn. I though my tune was ok for smog day. I'm also on cams so a stock re-flash will have me worried. Im not a tuner. I read there is a code (ID regional code?) on each ECU that needs to match what they have on record. Your tuner probably overwrote with another ECU code that isn't what's on record for your car. I'm not certain but would like to know for certain myself. What a PITA. Sorry you got flagged:crap: Im surprised you rolled in w/an open O2 dump, but it doest look like that was flagged? For the turbo charger / supercharger section it says not applicable. When I smogged my car I was told the "book" says my car should not have a turbo. Weird I wonder if that makes a difference. Referee Centers also reinspect vehicles that receive a "DATA CHECK FAIL" during a BAR-OIS inspection. A "DATA CHECK FAIL" occurs when data downloaded from the vehicle's OBD system during its last inspection is inappropriate for that vehicle. In order for the vehicle to receive a Smog Check certificate, the Referee must perform an inspection and verify the appropriateness of the data. 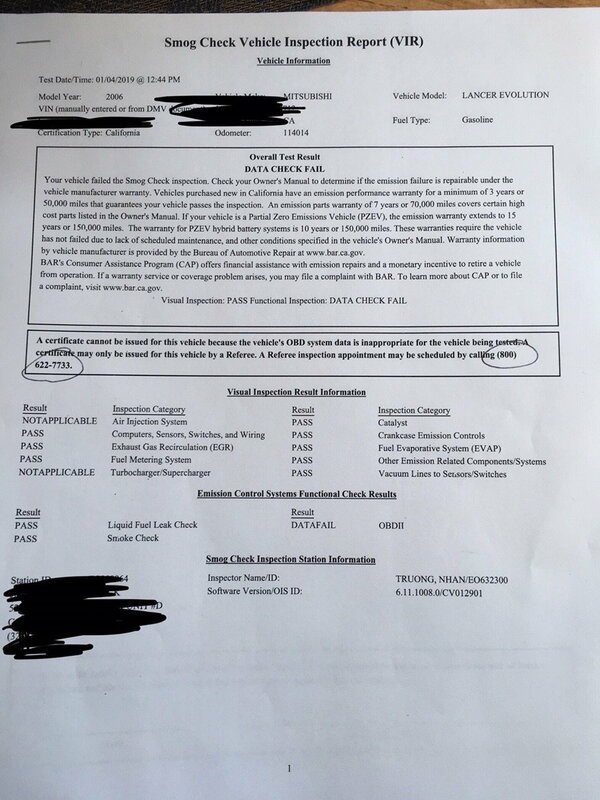 Note that once the Referee issues a Smog Check certificate to your vehicle, it may again be inspected at other stations during the next inspection cycle. A Referee inspection appointment may be scheduled by calling (800) 622-7733. Correct, that's the experience that I had when I got reffed 8 years ago. They want to see EVERYTHING stock. Anything flashy in the slightest bit will have you sent home to return it back to stock. They even use a mirror under your car to check and see if there are any brushed aluminum or shiny parts down there as if you are carrying drugs. Rust and oxidation are your best friend here. They like seeing rust and oxidation. This "Visual inspection," as they like to call it, was actually a behavior passed down to the CA judicial branch from the Nazis back in WWII. Your evo can pass the emissions test with better ratings than many camrys out there, but it will still be failed by visual. I still don't understand the logic behind it....because it's NOT logical. OP, Best of luck to you in your quest to make it pass. Remember, if they can SEE it, they will fail it. If your cams sound stock and produce passing emissions, they will NOT fail you because they won't know about them. They will not remove the valve cover to check this and most of them are not trained to measure cam shaft lobe differences between aftermarket and stock. Many cams don't have markings that give it away either. CA strikes again. Such a horrible state to live in. My biggest concern would be the cams. The s2 cams do not idle smooth at all. I would imagine that the state refs know what aftermarket cams sound like. Even with stock exhaust, I'm sure you can hear them lope. Good luck with this OP! Damn sorry to hear about your smog. I live in socal too but what my tuner was just flashed my ecu to a different rom and turned back on all my monitors and then it was good to go then I just had it reflashed back to my tune after the smog. There is a way to pass without the flashing back and forth nonsense. I'm confused, was there something in the OBD II check that triggered the fail? Like a PID turned off and the Smog check software picked up on it? Yeah I know its a bit of a hassle. What do you do?